Once the snow flies, we naturally settle into the warmth and comfort of our homes. But as with all good things, too much hominess can lead to cabin fever. 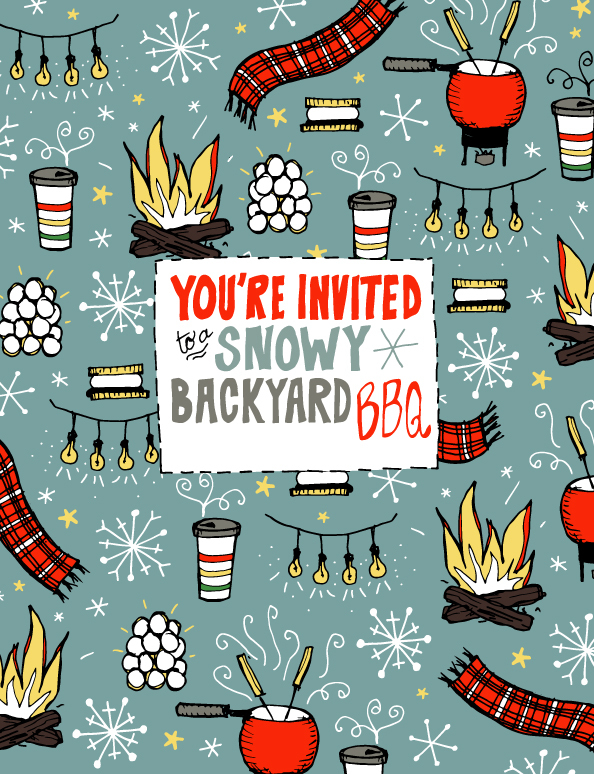 So, break out of a wintertime rut by inviting some friends over for a backyard barbecue—snow and all. It can even be après ski, since they’ll already be dressed for the occasion. As a corporate event planner, I always look to add an element of surprise to any gathering. It might be an unexpected menu item, an intriguing performer, or a compelling activity for the group or the individual. Even the smallest surprise can keep guests talking about an event long after it ends. The idea of serving dinner outdoors in frosty weather fits this strategy perfectly and lets you be homey, social, and creative all at once. Start by creating a welcoming backdrop for your party. Clear all of the snow from the deck or patio so people can mingle without getting water in their boots. If you expect flakes to fall during the party, consider using a covered area. You can clear out the garage and maintain the feeling of being outdoors by keeping the door up. Or create a protected zone by stringing clear landscape plastic or a tarp above your designated seating area. Either way, construct a space where guests can gather in an area protected from the wind. Hang bistro lights, preferably with amber bulbs, to cast a cozy ambience on the party. Also consider adding a propane-powered portable patio heater or two. They generate a surprising amount of warmth. Candles, tabletop fire bowls, and strategically placed lanterns also help to up the temperature. If you think the party might spill onto the lawn, create a fun snowscape with packed paths for walking, snow seats covered with heavy rugs or wool blankets, and a fire feature in the center to encourage your guests to gather ’round. A designated burn barrel, a bonfire, a contained fire bowl, or even just a charcoal grill will work well. For an extra touch, try lighting the pathway with traditional Swedish snow lanterns. All you need are snowballs and tea light candles (see sidebar). Finally, play a summer soundtrack with upbeat music like reggae or hip-hop. You could even create a custom list of summer-specific songs to make your guests subliminally bask in the sunshine. Think “Summer Breeze” by Seals and Crofts or a soundtrack based on SiriusXM’s Yacht Rock Radio picks. Let your friends and family know that you’re inviting them to an outdoor party so they can dress properly. But plan for guests who come ill-prepared with a self-serve basket from which they can borrow cold-weather wear like warm hats, mittens, and scarfs, big wool socks they can pull on over their own, and extra fleece or wool layers. Also keep a stack of blankets on hand for guests to wrap around themselves as necessary. In the yard, display disposable hand and foot warmers and old-fashioned hot water bottles, which you can purchase inexpensively online or from most pharmacies. You can also fill clean ski socks with uncooked rice, knot the end, and then heat them in the microwave for 60 seconds for waterless hot packs that guests can hang around their necks. Of course, you’ll need to designate an area inside your house where visitors can go to warm up if they need to. But don’t make it too elaborate or inviting, unless you want the whole party to shift indoors. Also, make sure to keep a clear and obvious path to the bathroom and let people know if it’s OK to wear boots inside. Your menu provides a great opportunity to cultivate a toasty feeling during the festivities. Of course you should plan for hot food, rather than a deli tray, but also use warming spices such as garlic, ginger, pepper, cumin, and cinnamon in your dishes to create true warmth and not just an illusion. Consider serving chili, soup, or a stew that includes these ingredients, or add them to a marinade or sauce for meat on the grill. Encourage guests to gather near the warmth of the grill by having them cook their own skewers. Or create a fondue station for dipping chunks of bread or meat into melted cheese or bubbling oil. When practical, serve hot food in mugs and bowls that guests can cup in their hands for warmth. Keep the summer vibe going by serving camping-inspired desserts. Try grilled pound cake topped with a gingery fig compote, make-your-own s’mores with holiday-themed Peeps, or a cast-iron skillet cobbler filled with pears and cranberries or apples and pomegranate seeds. Include instructions to BYOM (Bring Your Own Mug) in the invitations, or gather a selection of mugs with lids (consider a trip to the thrift store if you don’t have enough at home) and place them on a serving table alongside large, vacuum-insulated flasks filled with hot cider, hot chocolate, and hot tea. Guests can top off whenever they need a warmup. If you want to serve adult beverages, be aware that, while alcohol may temporarily give you a warm glow, it actually causes the core body temperature to drop. For this reason, you might want to consider saving the booze for another event or be prepared to move inside if the party does get raucous. Get your guests moving with fun backyard activities. You can adapt summer games to a snowy field: bocce on a walled snow course, snowball dodgeball, or a game of snowshoe Ultimate Frisbee. Start a rambunctious tug-of-war with a soft snow landing zone, or park a fleet of toboggans at the top of a hill and rally everyone for some sledding. For a finale, schedule a time to turn off all lights, blow out the candles, and extinguish the fires so everyone can take advantage of the stargazing on a clear night. Prepare a pile of fist-size, well-packed snowballs. You’ll need about 20 for a moderate size lantern. Use a spray bottle to add moisture if the Teton powder doesn’t stick. Build a circular base with the first row of snowballs. They should be touching but not tight, as you want the light to shine through any cracks. Make a straight column using the same number of snowballs on each row, or a cone with one less snowball per row as you go up, making a single cap on the very top. Before you cap the lantern, set tea light candles around the inside perimeter. Light them when you’re ready to set your backyard aglow and plan on them lasting a few hours. Variation: Use snow paint or food coloring to add pizzazz to your lantern. Stick to a color scheme, make a tie-dye pattern, or go random. Let guests know the party will be outdoors. Include hot entrees and sides; use mugs and bowls for serving. Gather guests around the grill for warmth and a hands-on meal. Clear snow from the deck or patio; designate a covered seating area. Hang bistro lights; add ambient warmth with patio heaters, tabletop fire bowls, candles, lanterns. Create a snowscape on the lawn; cover seating with heavy rugs or wool throws. Put out a selection of cold- weather wear for guests to borrow. Provide disposable hand and foot warmers, old-fashioned hot-water bottles, DIY heat packs. Designate a warm-up area inside, with easy access to a bathroom. Serve warming foods like chili, soup, stew or fondue; serve in mugs that can double as hand warmers. Serve spicy foods to create the impression of warmth. Create a snow field for bocce, snowball dodgeball, or snowshoe Ultimate Frisbee. Organize a tug-of-war or get everyone sledding.